The Senate asked Mr Malami to appear before it in plenary and explain the constitutional basis for the controversial Executive Order No. 006 and the other Executive Orders which have been issued by President Muhammadu Buhari. They said the orders were issued in clear usurpation of the lawmaking functions of the National Assembly. It also urged the federal government to urgently empanel a Judicial Commission of Inquiry to investigate all cases of human rights abuse allegedly committed by the Police, the Nigerian Army and other security agencies in the course of discharging their duties with a view to identifying the culprits and victims and offering redress where necessary. These resolutions were sequel to a motion sponsored by David Umaru (PDP, Niger East). Mr Umaru said Nigeria's democratic credentials have become questionable as a result of the alarming cases of alleged state-inspired human rights violations and consistent constitutional infractions perpetrated by agencies of government. He said allegations abound that the executive has not only consistently violated the fundamental rights of Nigerian citizens particularly the rights to dignity of human person and right to personal liberty but also infringed on the Constitution in several ways. The lawmaker made reference to the continuous detention of the former National Security Adviser, Sambo Dasuki, who has been detained "for over two years in total disregard of over four court orders, including that of the ECOWAS Court which granted him bail pending his trial over money laundering charges" and the continuous incarceration of the leader of the lslamic Movement in Nigeria ( IMN), also known as Shiite, lbrahim El-Zakzaki "for over two years contrary to an order of the Federal High Court which ordered his release in 2016." He also made reference to the recent arrest of a senator, Enyinnaya Abaribe, "who was whisked away by a detachment of DSS personnel while attending a function at Transcorp Hilton Hotel, Abuja and later kept incommunicado at DSS detention facility for five days. "There is lack of accountability for human rights violations by security agencies and other militant elements including armed herdsmen; heavy-handed violent responses to peaceful protests as exemplified by previous crackdown an agitators for the Independent State of Biafra (IPOB) and the recent violent clashes between the police and suspected members of the IMN who were protesting the release of their leader, lbrahim EL-Zakzaky in Abuja and Kaduna respectively," he said. He further raised alarm over the recent enactment of the controversial Executive Order No. 006 as an Executive legislation which permits security agencies to freeze the asset of persons standing trial without recourse to court order. "Several other Executive Orders have also effectively usurped legislative and judicial powers of the National Assembly and the judiciary as enshrined respectively under sections 4 and 6 of the Constitution," he added. 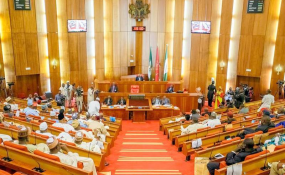 Several lawmakers stood up to support the motion included Shehu Sani (APC, Kaduna Central), who condemned the violations of Nigerians' rights by the federal government on several occasions. "We may be comfortable today because we occupy this office but when we are out of this place, we are likely to fall victims," he explained. He also said the Executive Order should "comply and concur with the law." Yahaya Abdullahi was, however, stood up to "disassociate" himself from the motion. He said he was not in support of the motion because the matter has not gotten to a point to worry. Eyinnaya Abaribe (PDP, Abia) who was not happy with the comment of Mr Abdullahi stressed that he has been a victim of human rights violation. "I feel pained for a colleague to say it has not reached a level of worry when a senator can be arrested on the streets and detained for days. People have asked me not to talk too much so they won't come after me... again. "This is where this motion lies - human rights; I have my rights to speak and so do you. We are in a state where violence and chaos rules," he said. While making reference to the alleged maltreatment of Ekiti State Governor, Ayodele Fayose in the state's Government House, Mr Abaribe said he did not want Nigeria to "descend into a pit of tyranny and we will say we are alright because we are elites." "If this hallowed chamber cannot speak up here, then we might as well pack up. We are in trouble under this particular regime and it is our right under the constitution to fight for our human rights," he added. "Call on the Federal Government to take necessary measures and/or establish necessary structures to ensure that all constitutionally guaranteed rights of citizens are protected and observed by its security and law enforcement agencies in the discharge of their responsibilities." It also urged the federal government to desist from further violation of the sacred principle of separation of powers and adopt the rule of law as the guiding principle of government actions.